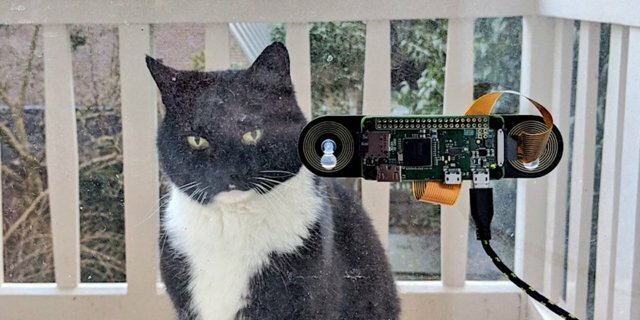 Engineer builds cat facial recognition device to notify them of their cat @Raspberry_Pi #PiDay #RaspberryPi « Adafruit Industries – Makers, hackers, artists, designers and engineers! Cat-tastic project from Arkaitz Garro featured on Business Insider. If you’ve ever lived with a cat, you’re probably used to finding it sitting outside a window or door, watching you reproachfully, waiting to be let in. It’s a situation that Arkaitz Garro, a WeTransfer software engineer living in Holland, has regularly found himself in. But rather than installing a pet-door, or letting his feline friend wait in the cold, Garro had a better idea: Building a gadget that would effectively let the cat, called Bobis, text him when he was outside the window and wanted to be let in.